We know them as kleenex and band aids, but they started out as trademarked brands. They are so popular and ubiquitous that we now use these names generically to describe any similar product. They are called generic trademarked brand names (or technically, proprietary eponyms). 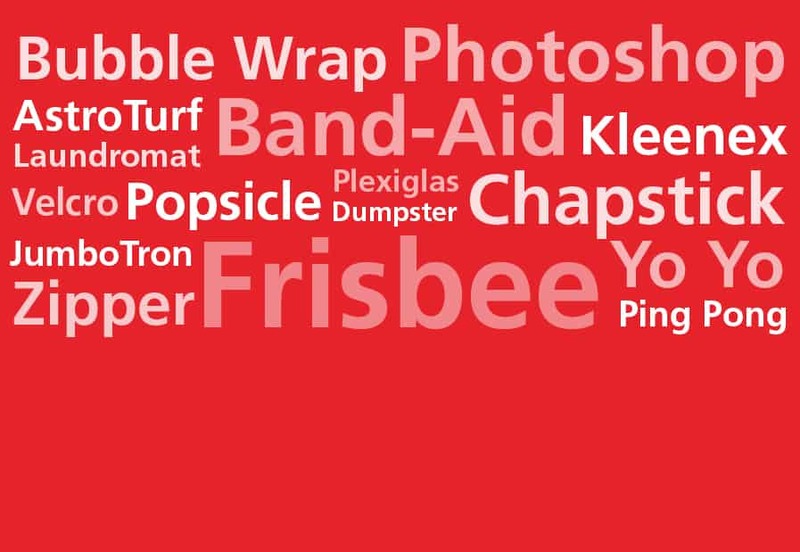 Check out this list of popular product names that are actually trademarked brands. Known as “short-pile synthetic turf,” AstroTurf was invented in 1965 by the Monsanto Company as a permanent replacement for natural grass on playing fields. AstroTurf was initially sold under the name “ChemGrass” but was changed to AstroTurf after it gained notoriety from use at the Houston Astrodome in 1966. “I am stuck on Band-Aid Brand, ’cause a Band-Aid’s stuck on me!” The song from the commercial was meant to reinforce the trademarked name from Johnson & Johnson, invented in 1920. But today most kids are more familiar with the term Band Aid than the generic “adhesive bandage”. Go ahead, give it a pop. You know you want to. Commonly called Bubble Wrap, its generic name is “air bubble packaging.” It was first introduced in 1960 by the Sealed Air Corporation. After failing to catch on for other uses, IBM began using it to safely package computers for shipping. The rest is packaging history. A product of the Morton Manufacturing Co. in 1912, the trademark for Chapstick is currently held by Pfizer. Generically called Chapstick, the product category is known as “lip balm”. These stinky trash receptacles were first created in 1936 by the Dempster Brothers Co. Originally called “mobile garbage bins”, they soon began to be known as Dumpsters—a play on the inventor’s name. The company called their front-loading garbage system the “Dempster Dumpmaster”. People soon shortened the two names to Dumpster. Fred Morrison came up with the “flying disc” in 1938. He and his future wife were on a Los Angeles-area beach tossing a cake pan back and forth for fun. An observer offered 25 cents for the pan and Morrison realized he was on to something big. 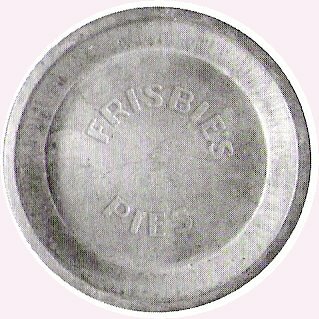 Introduced in 1957 by Wham-O it is now universally known as the Frisbee. What would the game experience be without replays on the huge JumboTron? Technically, it is called a “large-screen television.” Doesn’t roll off the tongue quite as nicely. Back in 1985, Sony introduced the huge non-projection video screen. Now it is made with LED technology and bigger than ever. The trademark is still in place, but the term jumbotron is taken to mean any large screen in a sports arena. Kimberly-Clark first marketed the tissue or “disposable handkerchief” as a face towel in 1924. They soon figured out it’s best use was as a replacement for the fabric handkerchief. It’s that place down on the corner where you wash your clothes, right? Or is that a “coin laundry shop”? In the 1950’s Westinghouse introduced the “wall-mounted automatic washing machine”, calling it Laundromat. Through widespread use the term laundromat has become a generic term for coin laundry. The legend goes that Frank Epperson invented the Popsicle after leaving a syrup-based drink outside on a freezing cold night. Epperson created the Popsicle in 1905. The Joe Lowe Co. of New York took control thereafter. Technically a “frozen ice treat on a stick,” the world today knows it as a Popsicle. 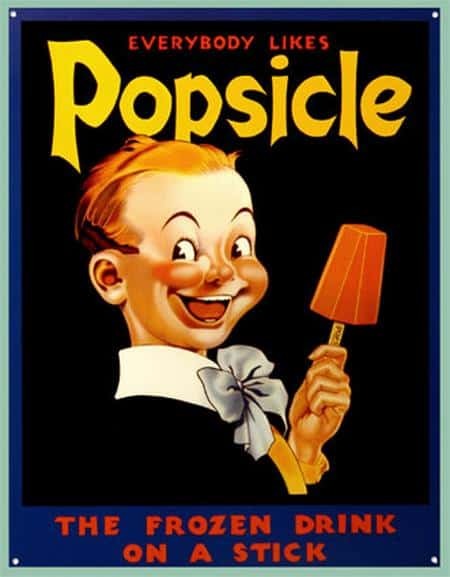 Early advertisements for Popsicle used the slogan “The frozen drink on a stick”. Table tennis was informally called “ping pong” or “wiff waff” since the late 1800s. Around 1901, Jaques & Son trademarked Ping Pong in the UK. Parker Brothers toy company purchased the rights and brought Ping Pong to the United States. In 1936 medical device maker Rohm and Haas came out with Plexiglas, also known as “moldable plastic” (polymethyl methacrylate). Plexiglas came to prominence in World War II through use in aircraft and other military applications. “Don’t tase me bro!” The stun gun was born in 1974 — a product of Jack Cover, a NASA researcher. Cover named the device after his childhood hero Tom Swift. The name Taser derives from the acronym for Thomas A. Swift’s Electric Rifle. 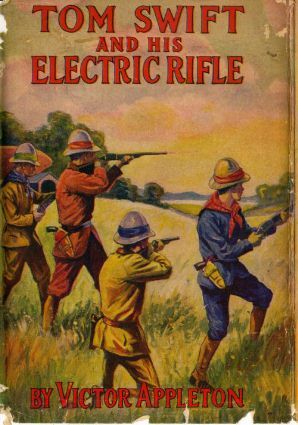 The fictional weapon was featured in the Tom Swift adventure novel of 1911 by Victor Appleton. Now manufactured by Taser International. The name Taser derives from the acronym for Thomas A. Swift’s Electric Rifle. Everyone is familiar with the distinctive sound of velcro ripping apart. But did you know it is generically called “tiny hooks that attach to loops and stick together”? Created for the Velcro company in 1941 by Swiss electrical engineer George de Mestral. He had gone for a walk through the woods with his dog and noticed several cockleburrs stuck to the dog’s fur. He applied the same concept to his new product, Velcro. The Universal Fastener Company changed clothing forever in 1917. They called their “separable fastener” the Zipper. It has changed very little from its original design. There are many more generic trademarked brand names than you might realize. They are used so commonly in language that they hide easily in plain site. See how many more you can discover! Ever wonder what your dreams mean? Check out this list of common dreams interpreted.